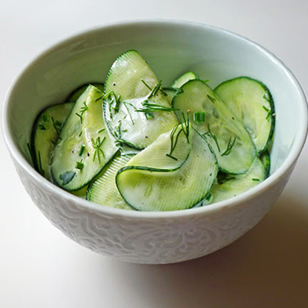 Cucumber Dill Salad, Appetizers & Meals: Southern Flavoring Company, Inc. In a large serving bowl, combine cucumbers, onions and Terrapin Mountain Dill Weed. In a medium size bowl, combined sugar, vinegar, water and salt; stir until the sugar dissolves. Pour the liquid mixture over the cucumber mixture. Cover and refrigerate at least 2 hours before serving.